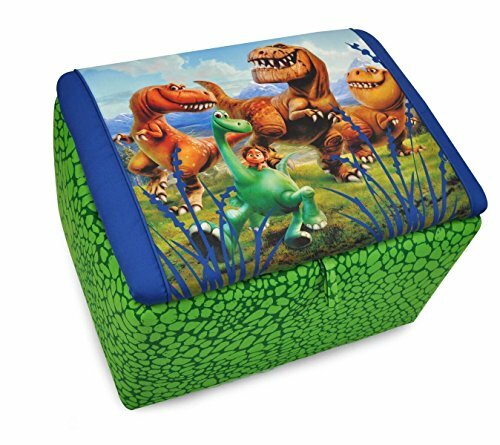 The double-duty Kidz World Good Dinosaur Upholstered Storage Bench acts as a comfy place to sit a spell and also a place to store toys, blankets, and more of your kid’s favorite things. This sweet storage bench has a sturdy, wooden frame, 100% polyester upholstery and generous padding with densified fiber for safety, comfort, and durability. The bench’s lid lifts with a simple pull of a fabric tab, and features a high-quality print of Disney’s “Inside Out” favorite characters Spot, Arlo, Butch, Nash, and Ramsey on a blue background. The bench’s sides feature a fun green dinosaur-scale pattern that roars with fun. This storage bench is safe for even the littlest hands, as the lid is equipped with spring-loaded hinges that enable it to be propped open at any angle, so it won’t drop down on its own. Dimensions: 28W x 20D x 16H in.. Sturdy wooden frame. Upholstered in blue and green 100% polyester fabric. Lid features printed image of Disney’s “The Good Dinosaur” characters. Lid pulls open with fabric tab. Lid with spring-loaded closing mechanism for safety.